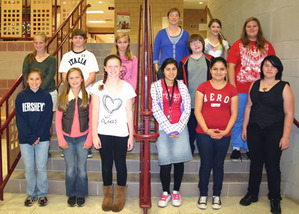 Pictured with Principal Lisa Stenz, Penn’s Grove Middle School seventh grade Students of the Month for September are (front from left) Julia Gunzel, Tara Hazy, Steyzy Valero-Martinez, Jasmin Cordova Rangel, Alex Schoessler and Christopher Cisneros-Guzman; top from left, Mackenzie Russell, Angelica Villalobos, Alyssa Beauregard, Kaitlyn Martin, Shannon Martin and Jimmy Yunker. 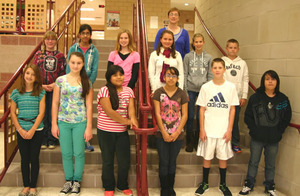 Penn’s Grove Middle School eighth grade Students of the Month for September are pictured with principal Lisa Stenz. They are (front from left) Abigail Herman, Mikayla Oatman, Samantha Omara, Kennia Urrutia, Delia Cerrato-Juarez and Katherine DiMatteo; top from left, Elizabeth Lentz, Tyler Barbone, Jessica Reynolds, Victor Gates, Alyse Campbell and Paige Blum.